China, Tokyo, Hongkong? What do these three countries have in common? Hint: They all call it: “The happiest place on earth”. When I was a child, I used to watch Disney films. I, being Aurora, and my two sisters as Belle and Arielle. It was so colourful and full of fantasy. Growing up, it was always our dream to be part and experience the world of Disney, to meet and talk to them or even just to see their majestic castles & Disney gowns up-close. So when The Walt Disney Company decided to have an amusement park which we can meet our favourite characters, I felt excited and somehow ask myself, when and how I will get there. Hongkong Disneyland was opened on September 12, 2005 and is known as one of the shortest construction periods for any Disneyland themed park. As one of the two large parks in Hongkong, Disney made consideration to the Chinese culture, tradition and custom in building and designing the park. They have seven themed attractions: Toy Storyland, Mystic Point, Grizzly Gulch, Adventureland, Fantasyland, Tomorrowland and Main Street, USA. (Toy Storyland and Fantasyland are my top!) Also, guide maps are printed in different languages for everyone’s convenience. Fast forward, June of 2016 came, Jherson told me that we will be visiting the happiest place on earth. Reminiscing that moment was really remarkable. I mean, it’s like winning an overnight to a luxury hotel or an all-expense trip to Europe. And how lucky we are because Disney is celebrating its 10th year anniversary when we got there and they just recently launch their Star Wars Experience Fever!!! Cool right!??? So anyways, enough of the blurbs, it was Thursday when we went to Hongkong, the sun was shining brightly and we were very excited. Our hotel was located in Tsim Sha Tsui. So, from our hotel, we had 5 minutes’ walk to MTR station. From Tsim Sha Tsui Station, we got off to Lai King Station and transfer to Tung Chung Line. After that, your most awaiting next stop will be Sunny Bay where our well-loved DISNEYLAND is located. Disneyland has its own train line. And oh my! The train is so vibrant and lively! From windows, to hand trails and displays. Mickey Mouse and friends are everywhere. I can’t help but hugged Jherson while going there because of excitement. Train ride will take you around 6 to 10 minutes. Before going in the amusement park, you need to get your tickets (entrance and meal stub) on their Disney machine and Ola! You are few steps away from you Magic Land. 1. Go as early as you can. Don’t wait for 10am. (Unless your hotel is within the area). If you want to be first in line or to have a good shot to their beautiful and picturesque banner or just to have an early great scene or vibe on the place then be early. You won’t regret that ever. 3. Go to Disneyland on weekdays if possible to avoid massive crowd. 4. Stickers are not given unless being asked. Don’t be ashamed on asking stickers because it’s for everyone and it’s free. It would be a good souvenir for yourself or you can give to your kids someday. 5. Always check your map for guide. 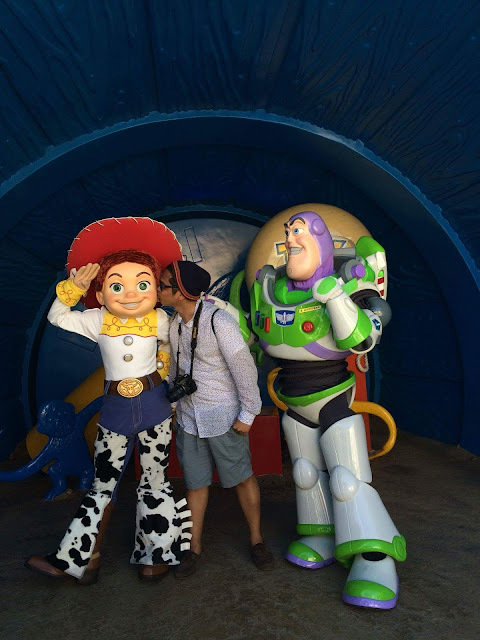 Picture-taking with Disney characters have time schedules. So make sure to balance your time well. Also some rides / parks have allotted time when will it be open and close. 6. Theatre shows is a must when you are in Disney. Lines seem long but when they started to let you in, it’s no sweat. Theatre is one of the highlights of our adventure. I recommend having it in morning activity. 7. Wear comfortable shoes and don’t forget to bring caps or anything that will protect you from sun because it’s an outdoor place. 8. Bring water and snack bites while inside the park. Food is a bit expensive unless it’s included in your budget. 9. Disney Paint the Night and Disney in the Stars Fireworks is a must! Disney Paint the Night features original floats with fully-LED parade of Disney characters, where you can say hi to your favourites and dance with the beat of the sound. While, Disney in the Stars is a nightly firework show that coordinated with Classic Disney music. It’s a great way to end your magical adventure! Each attraction last for one to two hours. 11. Believe it or not, you can explore Disneyland in one day (because we did!) You just need to plan your time well and avoid too much excitement. Haha. 12. Lastly, take pictures as many as you can. Have all the rides without hesitation. Watch all the musical shows. Walk, Run Laugh. It’s DISNEYLAND and not everyone can visit this extraordinary amusement park. So savour every hour, every minute and second while you are there! Disneyland Discounted Tickets, online reservation is more convenient with Klook. An app for booking travel activities within your reach. 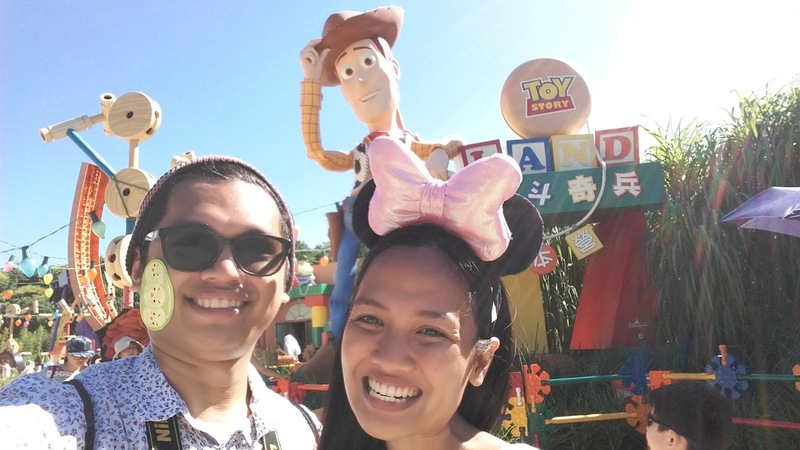 We bought our Disneyland tickets together with a meal stub with abig discount from klook.